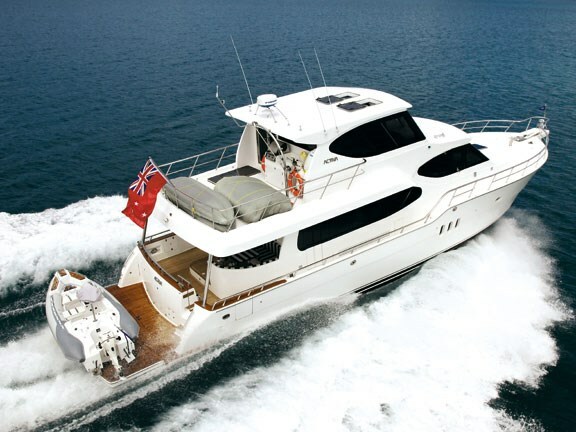 Activa boats, imported into New Zealand by Adventure Bay Motor Yachts, is known for its timeless classic designs. So the latest model, the 6400 Contemporary, is something of a break from tradition. 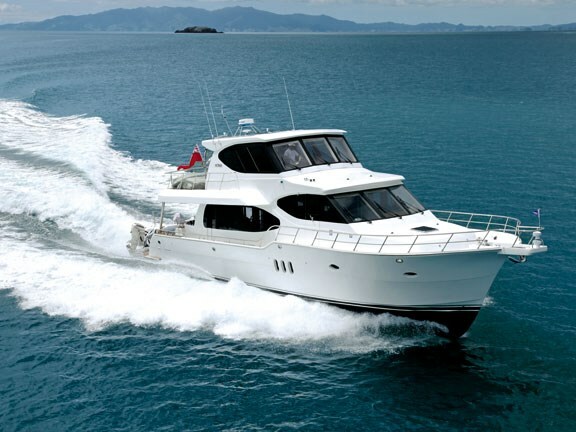 Fluid, flowing lines have replaced the traditional trawler styling on this latest model. Forward sloping stanchions and rounded window profiles fitted with tinted glass give the boat a much more modern look. 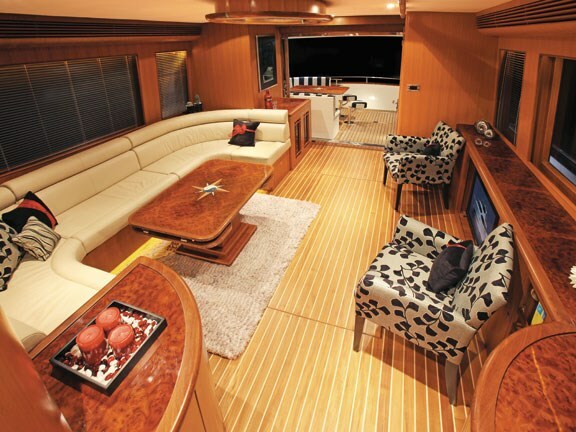 The flybridge is now fully-enclosed – and as a result the teak and leather interior of the main cabin continues upstairs. 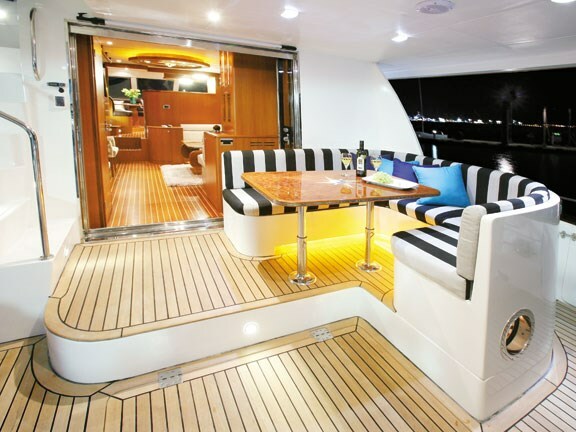 Although much of the boat incorporates subtle changes when compared to the trawler layout, it is in the flybridge where the design is most dramatically different. Apart from the teak and leather finish, the upstairs helm station has been upgraded to become the primary helm. In the process the helm controls in the pilothouse area below have been eliminated, although there is still an auxiliary set of engine controls in the cockpit for use when docking. Three large Furuno colour LCD displays dominate the flybridge’s dash area, and each of these can be configured to display whatever combination is preferred. Chartplotter, sonar and radar are, of course, standard, but any other digital info can be shown on the screens. The display can also be sent down to the LCD TV’s in the cabins, allowing the skipper or crew member to check the boat’s vital signs without getting out of bed. Large, tinted front windows have expansive wipers to keep them clear in all conditions. But John Winter, managing director of Adventure Bay Motor Yachts, has specified an additional, unique feature for the New Zealand version of this boat. Along the top of each of the main windows is a narrow but sturdy glass hatch. These are hinged along the top edge and open outwards for better ventilation and wet weather views. Says Winter: "New Zealand weather – combined with our busy harbours – often create a tricky situation of low-visibility where reflections on the wet glass can be problematic. It’s important to have an unimpeded view, something that is difficult to achieve in a fixed-window bridge." Since the hatches open upwards, the glass acts as a shield to prevent rain falling through the opening, while the lack of glass will provide a clear view in those tricky conditions. Comfort throughout the flybridge area has been upgraded to the same luxury standard as downstairs, and the fully-adjustable helm seats now feature stitched leather upholstery. An attached footrest swivels with the seat and complements the fixed footrest fitted to the bulkhead. These seats are supremely comfortable, with a second identical seat next to the main helm being available for the first mate. A sunroof (two polycarbonate hatches) has been created in the ceiling, complete with sliding sunscreens to block out light as required. 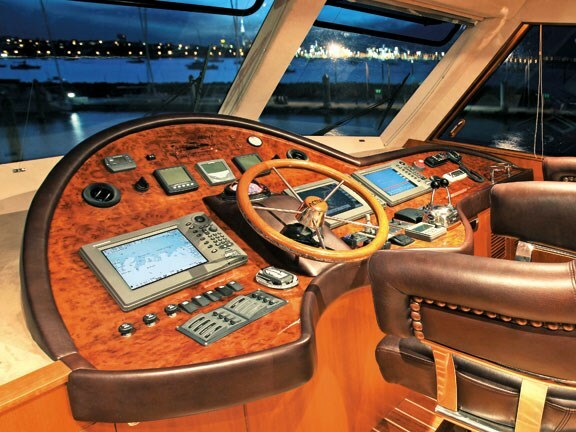 A walnut finish over the dash adds to the luxury feel, and the couch and swivel seats in the lounge area just behind the helm are in a similar vein. 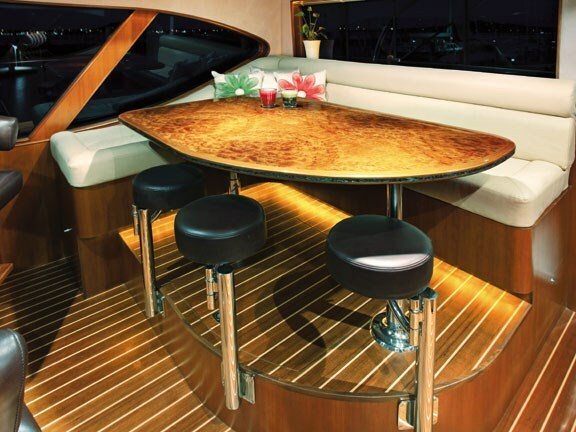 A nice touch is the offset swivel-mounted bar seats around the table, which tuck completely under the table when not in use. 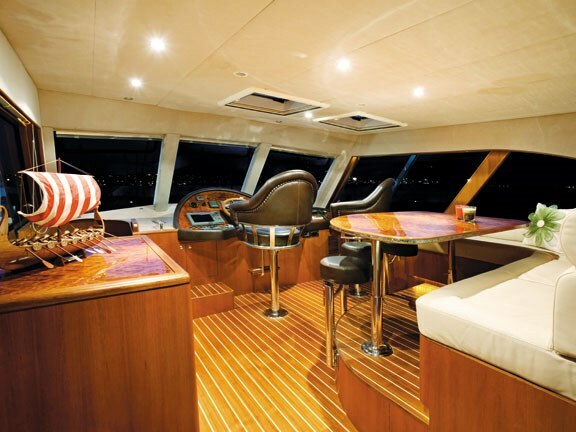 A bar fridge set under the counter ensures the skipper can be kept well-hydrated. With comfortable seating for half a dozen, the flybridge is likely to be the most popular spot on the boat while underway. Moving downstairs (via a generous internal staircase), you’ll find the boat’s main saloon relatively unchanged from the trawler version. Almost the entire back wall of the saloon slides open to provide unimpeded access and views of the stern area. All seating areas are arranged in a convivial ‘C’ shape. A couple of loose easy chairs provide extra seating, and the whole area features superb woodwork, including the Paua inlays which characterises the Activa range. Moving out through the large rear doors we find another lounge area in the external cockpit. Again, laid out in the ‘C’ shape, it enables guests to either face into the saloon or out to the boarding platform. On the port side a hatch pops up to reveal an auxiliary set of engine and bow-thruster controls, making this the perfect spot for guiding the vessel into its berth. The cockpit area is covered by an extended hard top, keeping the sun and rain at bay. Fishing is still possible while standing at the transom, despite the extended cover, with fish being retrieved either over the side or by stepping down onto the submersible swim platform. Washdown hoses keep the cockpit clean, and a fishbin is set into the swim platform to hold the catch. The swim platform (ideal for fishing off in calm conditions), is dominated by the Aquapro 4m semi-rigid inflatable with its Evinrude E-TEC outboard. This is easily launched thanks the hydraulically-lowered platform. Once down the tender simply floats off its stainless steel brackets. Other water toys such as the 2.7m inflatable and two kayaks are stored on the flybridge level, all launched with the nearby davit. An external staircase leads up to the water toys area to avoid wet footprints through the main cabin. Also stored upstairs is a stainless barbecue for al fresco cooking. 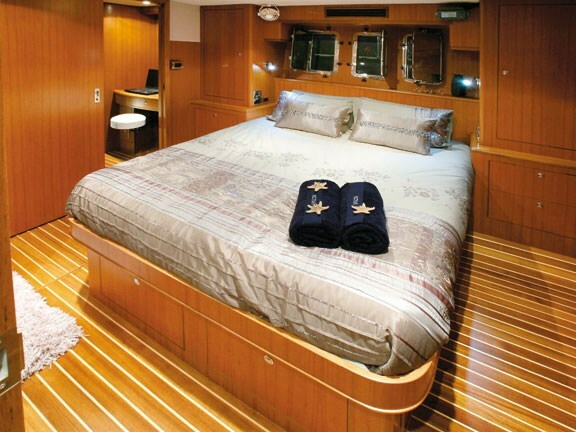 An external head with hot water shower is situated on the starboard side of the boat, so guests or crew can clean themselves of salt or fishy mess before coming into the saloon. The shower is reached from the walkway that runs up the side of the cabin area to the foredeck. On a boat of this size it is conceivable that the owners would employ a skipper, and a separate cabin with a quarter berth is provided for this purpose. 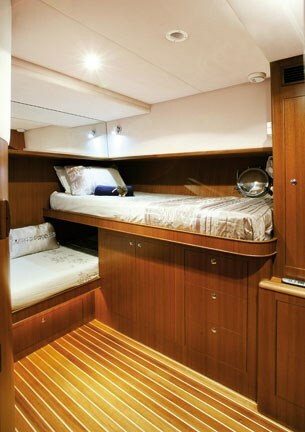 The cabin has a separate entrance to ensure the crew never need intrude on the guest’s privacy. Entrance to the engine room is either by a large hatchway in the floor of the cockpit or through a hidden stairway on the port side of the main saloon. The boat is powered by twin Volvo D12 engines, together producing 1600hp. This propels the 38-tonne vessel to a top speed of 21 knots. Fuel capacity is 6000 litres, giving the boat an excellent range of about 2000nm at a more economical speed. Freshwater storage is 1100 litres and it’s complemented by a Sea Recovery watermaker. All appliances in the boat are standard 240v domestic units, while gas is used for the cooking. Winter says using top-range domestic units ensures that these are repairable or replaceable anywhere in the world, whereas specialised 12v or 24v appliances are considerably more difficult to support. A pair of grunty Mastervolt inverters complement the genset to provide continual power for the appliances. This boat has too many features to cover in a single review, and reflects the years of experience of both the boat builders and the Winter family. 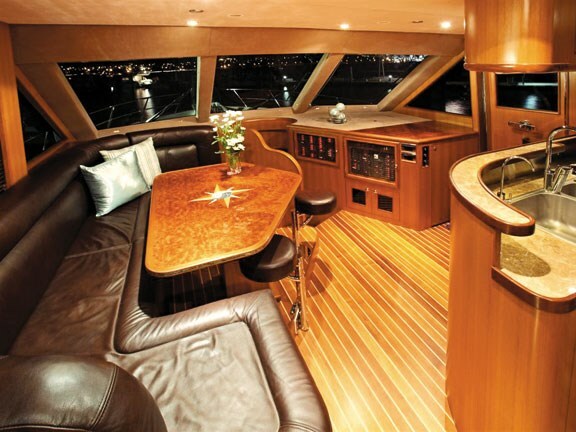 These Activa 6400 boats are built to New Zealand Survey standard and this boat could easily be used for corporate entertaining or similar commercial use. For more information visit www.adventurebay.co.nz or contact John Winter, ph 09 620 4620.